weber_cam: This is a sheet of dough! This is a sheet of dough! this is a sheet of dough!, originally uploaded by Seligman's Dog. 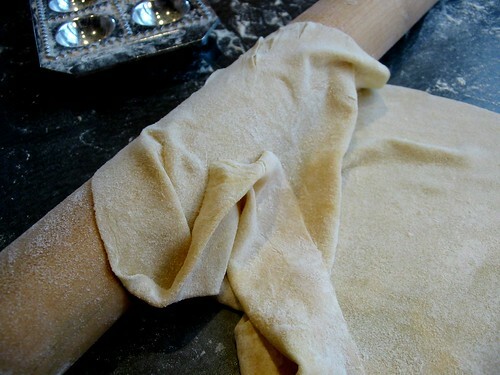 This is a sheet of thinly rolled out dough for ravioli. It started out last night looking like this. With this dough and about 20 sheets like it, Trish, Frankie and I made some of the BEST ravioli of our lives together. They were filled with spinach, ricotta and parmesan (and some nutmeg). I've never quite rolled the dough out so thin. It was quite tough too. I feared the dough might be too tough. Apparently, if it's thin enough, it just can't taste tough. Pretty good pasta experience. For the ravioli, we used this device. Nice shape and they stay together during boiling.